Comments on the revised “Statement on Standards for Continuing Professional Education Programs” (Uniform Accountancy Act Appendix B) should be sent to jluttrull@nasba.org by December 1, stated CPE Advisory Committee Chair Ted Lodden (IA) at the Annual Meeting. The exposure draft, originally released on August 15, 2011, can be found here. “These standards are for providers – the people who put together the programs,” Mr. Lodden underscored. They were last revised in 2002, and after that time the NASBA CPE Sponsor Registry’s “Frequently Asked Questions” and checklists were being used to provide guidance to course sponsors. 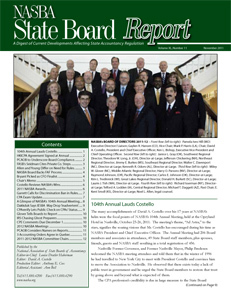 Following requests received at NASBA’s May 2010 Sponsor Open Forum, work on revising the standards began. “We tried to simplify and clarify the standards. Then we looked at innovation and providing room for future learning techniques,” Mr. Lodden said. Among the areas included in the proposed changes are: standard added for group-internet-based delivery method; alternative method for pilot-testing of self-study based on word count formula; and granting of half credits. The joint AICPA/NASBA CPE Standards Committee will make its final recommendations to the AICPA and NASBA Boards of Directors in January. It is anticipated the effective date for the new standards will be March 1, 2012.